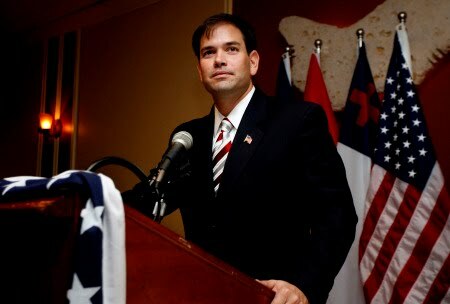 Leading US senate candidate for the Florida Senate Marco Rubio has penned a scathing piece in NRO blasting current Governor Charlie Crist for his participation in the passing of Barack Obama's stimulus bill last year. I continue to be disappointed by Charlie Crist’s unwillingness to acknowledge how his support for massive, unrestrained, and reckless federal spending is inflicting long-lasting damage on our economy. Last year, Republicans and Democrats debated the best course of action for re-igniting America’s economy. While Republicans were advocating for targeted efforts based on broad-based tax relief and spending reforms, Charlie Crist ignored those efforts, instead siding with Barack Obama and Congressional Democrats in favor of the largest spending bill in American history. That bill added more than one trillion dollars to our national debt and raised the debt ceiling. This is a debt our children and grandchildren will inherit. Our nation’s debt has exploded so rapidly that it is threatening our standing in the world, while significantly diminishing the options policymakers have to address the looming over-leveraging crisis facing our country. In many ways, the stimulus is emblematic of Washington at its worst and underscores the differences between me and my opponent. Charlie Crist remains a leading voice in support of a stimulus that was falsely sold to the American people as a job creator, was rushed through the legislative process with little chance for review or revision, and was loaded with special-interest pork that will do nothing to help the 1.1 million Floridians who are without work. Now, after a year in which independent analysis has proven its failure to meet the objectives under which it was sold, those in Washington and around the country who committed America to this failed policy continue to place their political careers above the best interests of our country. The differences between my opponent and me on the stimulus and on the virtues of limited government versus a heavy-handed, big-spending government represent the defining issues of this campaign. Although Charlie Crist’s support for big government policies has diminished his standing with Floridians who believe in the free enterprise system, I hope it won’t continue driving him to the desperate measures we’ve seen from him lately in a vain attempt to change the subject. Floridians deserve a serious debate on the major issues and challenges of our time, and I hope Governor Crist will engage in this kind of campaign moving forward. So what does Crist do? Focus on governing? He hasn’t been doing much of that for three years, so why start now. Will he make his own compelling case for bigger government and more spending, and let the chips fall where they may? Nope, he still insists on calling himself a “Reagan Republican.” So instead, he has opted to lash out with his most false, negative and personal attack on Marco Rubio to date.